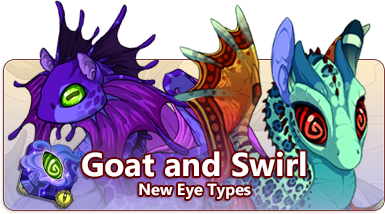 New eyes are appearing on dragons all over Sornieth! We've launched a brand new eye type: Goat. Goat displays as a mottled eye with a horizontal pupil. This naturally occurring eye type has a chance to appear when a dragon is hatched. Swirl displays as spiraled, hypnotic eye. This eye type must be applied with a vial, which has a chance of dropping from all coliseum enemies. For the next week, that chance is boosted! There are new emoji expressions for ridgeback, tundra, fae, and mirrors available to use around the site. Eye types available through the Vial of Scattersight (retired item) remain unaltered, and the tooltip has been updated to indicate which natural eye types it provides. All eye types should have a vial form, or be in a scatter sight type vial. This time you’ve actually banned all preexisting dragons from participating in a new eye type which is just cruel and unfair. Gotta say though, I am not a big fan of adding more eyes into the hatch pool. I think vials are a better way to go over all, especially since eyes cannot be passed down to offspring. Glad to see the Swirl eyes are a vial, and it is neat to see them in the coli. My personal grumblings aside, Thank you staff for all of your hard work!